Wedding season is coming up fast. Here are five dresses under €50 for if you need something to wear. It's nearing the end of March which means that wedding that seemed ages away is actually coming up really soon. You can't put off organising something to wear for much longer. But, if you're anything like us, we're guessing you don't want to spend a huge amount. If you're not planning on wearing something you already own, we've chosen five dresses that are totally wedding appropriate and they're purse-friendly too. Here are the wedding shoes that will go with every dress! We've chosen five dresses of different styles and colours so there's something for all tastes. But if nothing here takes your fancy, remember this dress from Zara? It is only €30 and we can see ourselves wearing it to a wedding and for loads of other occasions after. One of my favourites is the yellow number from New Look. It's also only €30 but the colour and simplicity actually make it seem more expensive. I also love the black slip dress from Topshop that I would dress with really bright accessories. There's actually a second yellow dress on the list, but it couldn't be more different from the first. It's made from a satin material and the shade is more muted. Which one do you prefer? Don't forget, there are loads of sales on at the minute, so now's a great time to get a wedding guest dress for less. 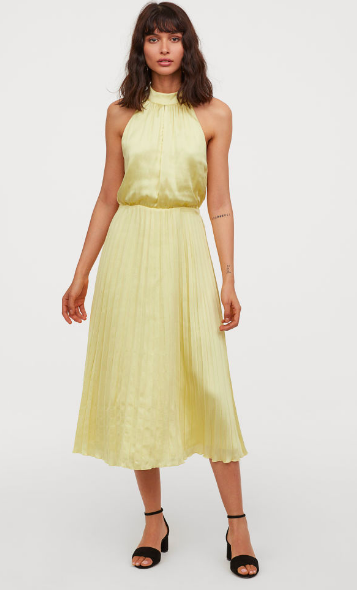 Do you find it hard to find wedding guest outfits for less? Would you be happy enough wearing something from Penneys to a wedding? We did a couple of summers ago and didn't regret a thing!